Introducing The Nanotec Heater wall-outlet space heater, other space heaters are big and bulky and can raise your electricity bill. 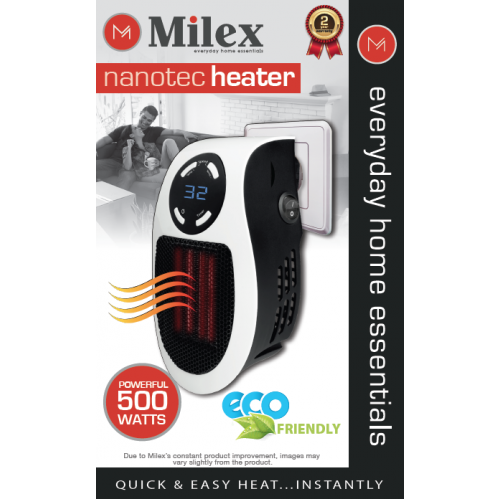 The Milex Nanotec heater is a whole room space heater that plugs right into the wall and takes up no space at all. The heater’s thermostatic design makes it small but powerful it turns the machine off if it overheats. 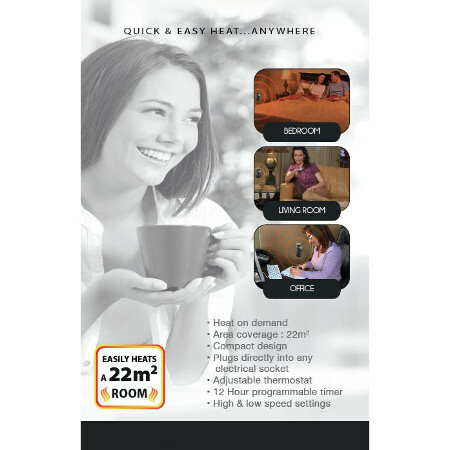 The heater powerful 500 watts easily heats a 22 sq. metre room with warm comforting heat. Transform any cold and chilly place into warm and cozy place. Perfect for any room in your home, dens, reading nooks, work, dorm rooms, offices, home offices, Campers, workspaces, benches, basements, garages and more. Simply plug the heater into any power outlet, set the digital control to your ideal temperature and feel your room get toasty warm. You can even keep your spot warm with the automatic timer. Perfect for chilly areas that have drafty windows and doors. Compact design makes it easy for travel, so you can enjoy warmth and comfort wherever you like to relax.